New president Paul Tansey has succeeded Vincent Boni at the helm of Dorset Chamber of Commerce and Industry. Paul Tansy received the chamber’s chain of office in front of more than 50 members at the business support organisation’s annual meeting in December. 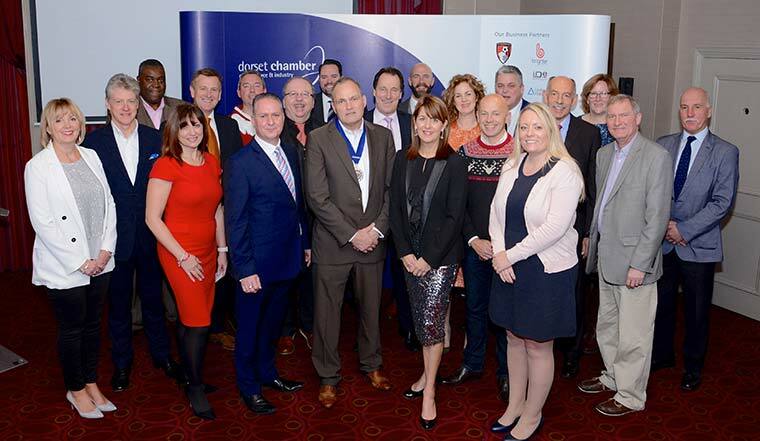 Paul pledged to build on the chamber’s successful Young Chamber and town chamber affiliation programmes as well as other initiatives such as its Dorset Business Alliance with the Federation of Small Businesses (FSB) and Institute of Directors (IoD). He added that the Dorset Chamber had made great strides in its marketing recently and intended to work with its team to modernise the chamber further. Paul is also to draw up a rolling three-year plan with Liz and Stephen to plot the way forward at a presidential level. Liz, who is managing director of Liz Lean PR, and Stephen, a partner at Mazars, are due to succeed Paul in 2019 and 2020. James Robinson of PKF Francis Clark was appointed honorary treasurer. Sunseeker chief executive Phil Popham and Inspire managing director Warren Munson were confirmed as non-executive directors for another year. Elected ambassadors were Simon West, Paul Collins, Kimberley Davies, Mandy Holford and James Akin-Smith. The AGM heard of successes during the past year, including the chamber’s business partner programme, Young Chamber scheme, town chamber affiliation initiative, growth of its international trade department and record demand for events. Visit www.dcci.co.uk for more about the Dorset Chamber, the voice of business in Dorset.